Produced by Foxtel, Seven Studios. Series Creator: Bevan Lee. Music: Michael Yezerski. 2CD (ST) Decca Records. 482 9001. 2017. 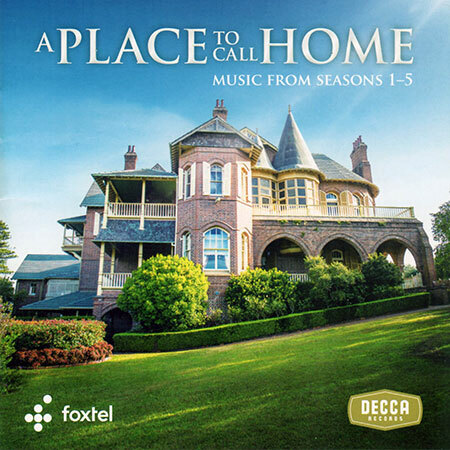 A Place To Call Home: Theme (Season 2). Michael Yezerski. Motherland (Season 1). Michael Yezerski. Ebb Tide (Season 1). Stuie French, featuring Shanley Del. Music! Music! Music! (Season 1). Teresa Brewer. Heart and Soul (Season 1). Al Alberts, The Four Aces. We’re Going to have a Baby (Season 1). Michael Yezerski. Bewitched, Bothered and Bewildered (Season 1). Ella Fitzgerald. It’s Coming (Season 2). Michael Yezerski. The Anniversary Waltz (Season 1). Vera Lynn. You Belong To Me (Season 1). Jo Stafford. Mona Lisa (Season 1). Michael Yezerski, featuring Glenn Cunningham. When I Fall In Love (Season 2). Nat King Cole. Mr. & Mrs. James Bligh (Season 1). Michael Yezerski. A Kiss to Build a Dream On (Season 2). Louis Armstrong. Lullaby of Broadway (Season 1). Doris Day with The Norman Luboff Choir and The Buddy Cole Quartet. Ash Park Morning (Season 1). Michael Yezerski. Rag Mop (Season 1). The Ames Brothers. Botch-A-Me (Ba-Ba-Baciami Piccina) (Season 1). Rosemary Clooney. Sh-Boom (Single Version) (Season 2). The Crew Cuts. Sway (Season 1). Stuie French, featuring Paul Fisher. Paris (Season 2). Michael Yezerski. I Believe (Season 2). Michael Yezerski, featuring Martha Marlow. Are You Awake? (Season 2). Michael Yezerski. No Other Love (Season 2). Michael Yezerski featuring Alex Oomens. Side by Side (Season 1). Kay Starr. You’re Nobody Till Somebody Loves You (Season 1). The Mills Brothers. Undecided (Season 1). The Ames Brothers. At Last (Season 1). Etta James. Amazing Grace (Season 1). Michael Yezerski, featuring Mahalia Barnes. When You’re Smiling (The Whole World Smiles with You) (Season 4). Frank Sinatra. The Beauty of Love (Season 4). Daniel Farrant, James Knight. Doris (Season 4). Michael Yezerski. Christening (Season 3). Michael Yezerski. Stones (Season 3). Michael Yezerski. Jesu, Joy of Man’s Desiring (Season 3). Peter Hurford. Prélude from ‘Te Deum’, H.146 (Season 2). The Michael Laird Brass Ensemble, Peter Hurford. George (Season 3). Michael Yezerski. Good Morning 1958 (Season 5). Michael Yezerski. Gymnopédie No. 1 (Season 3). Pascal Rogé. Mikvah (Season 5). Michael Yezerski. Gino By the Lake (Season 3). Michael Yezerski. I’ll Always Be in Love With You (Season 3). Charles Brown. Mr. Sandman (Season 4). The Puppini Sisters. A Marvelous Time (Season 3). Michael Yezerski. We’ll Meet Again (Season 3). Vera Lynn. As Time Goes By (Season 3). Dooley Wilson. Little Boxes (Season 5). Michael Yezerski. Close Your Eyes (Season 5). Michael Yezerski. The Trouble With Dogs (Season 3). Michael Yezerski. I Can Dream, Can’t I? (Season 3). The Andrews Sisters. Prejudice (Season 5). Michael Yezerski. Tradition (Season 5). Michael Yezerski. Truth Will Out (Season 4). Michael Yezerski. On Your Head (Season 5). Michael Yezerski. Consumated (Season 3). Michael Yezerski. Prelude in C major, BWV 846 (from The Well-Tempered Clavier) (Season 3). Andras Schiff. Bella Ciao (Season 3). Yves Montand. Would I Love You, Love You, Love You (Season 4). Patti Page. When I Grow Too Old to Dream. Vera Lynn. Unchained Melody. The Righteous Brothers.